As a CFA (Chartered Financial Analyst) and past denizen of Wall Street, I am always interested to see studies that relate data or trends to the performance of a group of stocks. The SRI (Socially Responsible Investment) industry has been producing some interesting work in this area, recently. For instance, our data was used as part of a study by Governance & Accountability on the relationship between sustainability and stock performance for the S&P 500. Our friends at GovernanceMetrics put out a study that showed a connection between the Accounting and Governance Risk (AGR) data and default in the CDS market (11 times more likely for companies in the bottom decile vs the top decile). And, our friends at Trucost have just released an extensive report on the State of Green Business (co-produced with GreenBiz). “ESG exclusion” describes a process that strips out “bad” stocks and overweights a portfolio with the top rated companies among the “good” stocks. “Simple ESG tilt” underweights “bad” stocks and overweights “good” stocks. 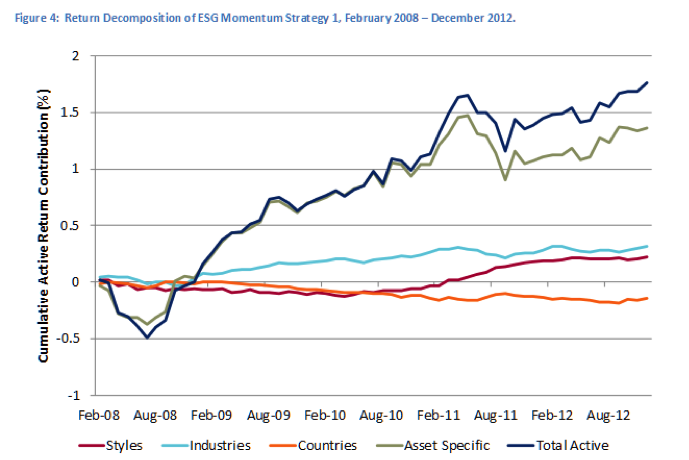 “ESG Momentum” focuses on stocks that are showing changes in their sustainability performance. It overweights companies that are improving and underweights those that are lagging behind. If you want to see the details of MSCI’s analysis of these strategies, you should download their report. I was surprised to learn that the momentum strategy dominated the other two over the four year horizon of the study. It was also reassuring to see that all three ESG strategies produced active return benefits. MSCI will host a webinar on March 21, where they will discuss their results. You can register for it, here. Please send me other interesting ideas in this area, and help me stay up to date on the latest development in SRI and ESG. CSRHub provides access to corporate social responsibility and sustainability ratings and information on nearly 7,000 companies from 135 industries in 82 countries. Managers, researchers and activists use CSRHub to benchmark company performance, learn how stakeholders evaluate company CSR practices and seek ways to change the world.